Everything We Keep is Kerry Lonsdale’s first novel. It came out in 2016. It tells the story of Aimee Tierney who lives in a small town in California and works in her parents’ restaurant. She’s expecting to marry James, who she’s known since elementary school, and eventually have a restaurant of her own. This story has a lot of secrets that Aimee learns about along the way: who Phil Donato really is; whose family the business actually belonged to; why James really went to Mexico; who paid Aimee’s lease while she was fixing up the restaurant and before she could open; why Imelda, who owns the hotel in Mexico, sent Lacy to find Aimee and why Thomas, James’ brother, did what he did. There are a lot of themes in this book. You’ll have to read it to see which one resonates the most with you—letting go, healing, forgiveness and love. Everything We Keep was a top Amazon bestseller of 2016, a Wall Street Journal bestseller and Barnes & Noble begins their review by saying “A luminous debut with unexpected twists…” Goodreads says 62,592 people rated “Everything We Keep” and 3,319 people wrote reviews. That’s a lot of readers! This was a very nice reception for a debut novel! 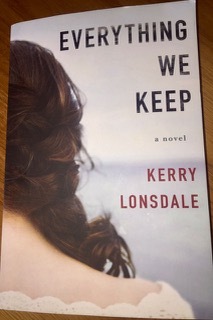 Claire, great job on your review of the debut novel, “Everything We Keep,” by Kerry Lonsdale. This is the type of book I love to read.